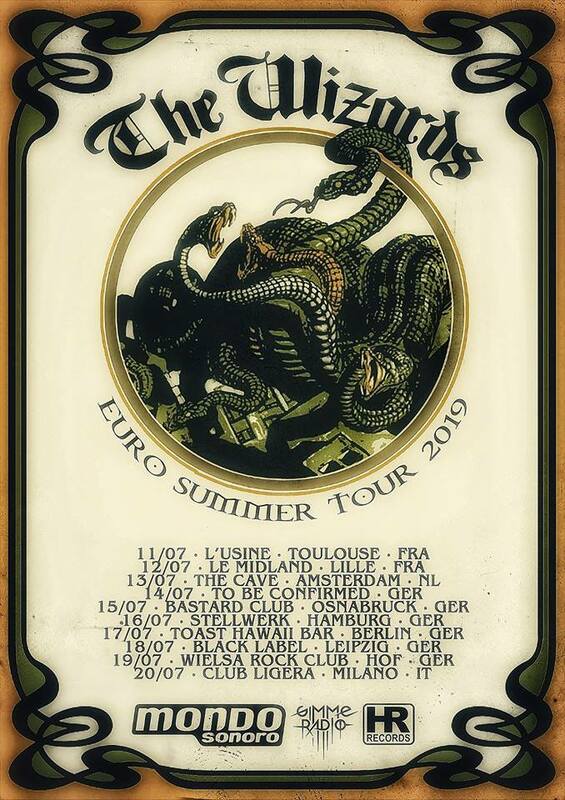 "Rails On Fire – High Voltage Rock im Stellwerk" präsentiert: The Wizards / support: C.Y.D. - Change Your Dealer Am 16.07.2019 im Stellwerk Hamburg Einlass: 20 Uhr Genre: Hardrock VVK: 11 € / AK: 14 € Hörbeispiel: https://www.youtube.com/watch?v=151difjs8c8 Tickets: TixForGigs: https://www.tixforgigs.com/site/Pages/Shop/ShowEvent.aspx?ID=29937 Eventim: https://bit.ly/2WRMTmh THE WIZARDS, eine 2013 gegründete und aus dem spanischen Bilbao stammende Heavy Band, können bisher zwei Alben und ein Demo vorweisen. Am 26.10. erscheint das dritte Album RISE OF THE SERPENT. Keine 18 Monate nach “Full moon in scorpio”. Stilistisch bewegt man sich in einer Schnittmenge aus klassischem Heavy Metal, kräftigen 70s Rock, hier ein bißchen Blues, da etwas mehr Doom und verpasst dem ganzen dann oft einen epischen Anstrich. Wer auf die ersten beiden ‘Iron Maiden’ Alben steht, zudem Fan von ‘Black Sabbath’ mit Dio ist, sich auch nicht vor ‘Danzig’ sträubt und das alles noch mit ‘Led Zeppelin’ vermischt, der wird mit THE WIZARDS richtig viel Freude haben. Das aktuelle Album RISE OF THE SERPENT ist am Ende ihr bisher bestes geworden und bringt bei aller Nostalgie und dem Retrocharme eine frische Brise in den angestaubten Sound der 70er! CHANGE YOUR DEALER: Over ten years ago Christian (bass) and Dennis (drums) met during their mandatory social service, driving handicapped children. One day on the way home they started talking about music and discovered they were much into the same stuff like 24-7-SPYZ, Living Colour, King X, Soundgarden and likewise. Christian had played guitar in a few bands already but after school it all faded away and he was on the edge of selling all his guitar stuff. Dennis had a small rehearsal room and they decided to jam a little for fun! It was not easy getting a band together since everytime when a line-up seemed finally complete something happened. First singer Henning got married and left, bassist Henrik moved to Romania with his wife and kids. And after that female singer Dacia (now Ex-Tape, then Pre-Tape) left cause that time they didn’t had a bass-player. Chris (singer) joined the band after Dacia left, he was an old buddy of Dennis. They worked together in the Markhalle, a famous venue in Hamburg, Germany. Chris was the one who came up with the bands name.They started writing songs together and went on looking for a new bass-player. But finding the last piece of the puzzle wasn’t that easy, so after many tryouts and experiments with different bassists Christian finally decided to change from guitar to bass, sensing it was much easier to find a good guitar-player than bassist. Enter Jan, lead-guitarist from band „Devils Day Off“ whom Chris knew. He was always open for new projects, so he was invited for a jam session! It immediately clicked between the four and C.Y.D. in its current setup was born. In the meantime the connection between C.Y.D and DDO was further strengthened with Christian joining DDO as 2nd guitarist. Now with an ever growing setlist of more than 20 songs C.Y.D. are ready to rock n´roll. "The Wizards / support: Change Your Dealer"